Great Lakes ports are choking on sediment. They are choking because they are located at the mouths of rivers draining watersheds of agricultural fields, forests, construction sites, and floodplains where erosion ceaselessly produces the sediment. The majority of the material deposited into the lakes near these river mouths will never leave. Thus, the Great Lakes are a giant sediment sink, slowly filling with the land that surrounds them. A key response to the choking of these ports is dredging, the mechanized uplift and movement of underwater sediment to create and maintain shipping channels, remove contaminated sediments, and produce landscapes at the land-water interface. This is accomplished with drill-like cutterhead dredges, vacuum-like suction dredges, miles of metal piping, and specialized bulldozers and excavators mounted on pontoons. For cost reasons, dredged sediment is typically transported the shortest possible distance where it will also be out of the way. Yet this material can only be “out of the way” for so long. 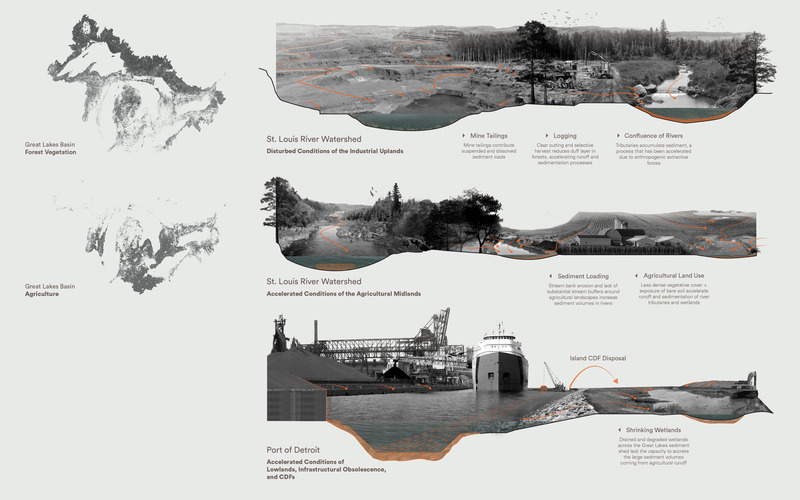 The placement of dredged material is slowly—and paradoxically—filling in river mouths around the Great Lakes Basin. Erosion and sedimentation are not inherently problematic. 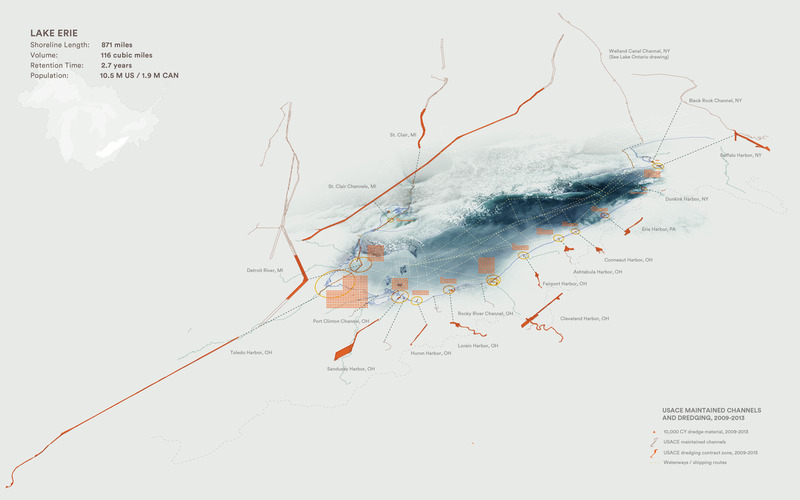 In the Great Lakes region, ports and urbanization are concentrated around river mouths. It is this confluence of urbanization, water, and sediment that produces conflicts and makes sediment “problematic.” For example, sediment clogs navigation channels, which forces shippers to lighten the load in their ships, reducing cargo volumes and raising shipping costs. Great Lakes river mouths have become chokepoints of sediment that impedes the economic activity they support. The infrastructural responses to sedimentation have generated unintended impacts on adjacent ecological and social systems. While dredging enabled the spread of industrial commerce throughout the region, it also generated a disposal problem. Open-water dumping was the initial response; it put sediment out of sight and out of mind. But industrialization generated toxic sediment and, as environmental awareness grew, so did concern over the contamination of river mouths. The solution to this problem: constructing diked islands and peninsulas to store sediment—Confined Disposal Facilities (CDFs)—which facilitated the physical separation of contaminated sediment from the river mouths. Today, however, these facilities are filling up, causing ports to look for alternative methods of disposal and placement. 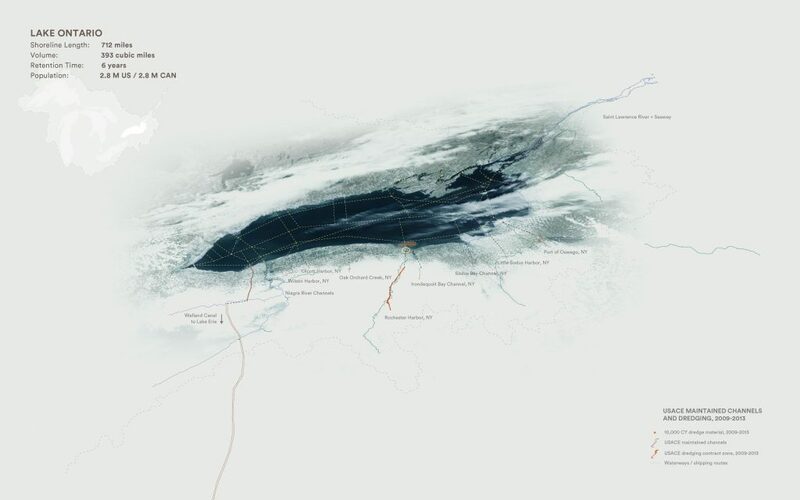 The following maps, diagrams, and photographs—researched and created by the Dredge Research Collaborative—visually describe the dynamics of dredging in the Great Lakes Basin. 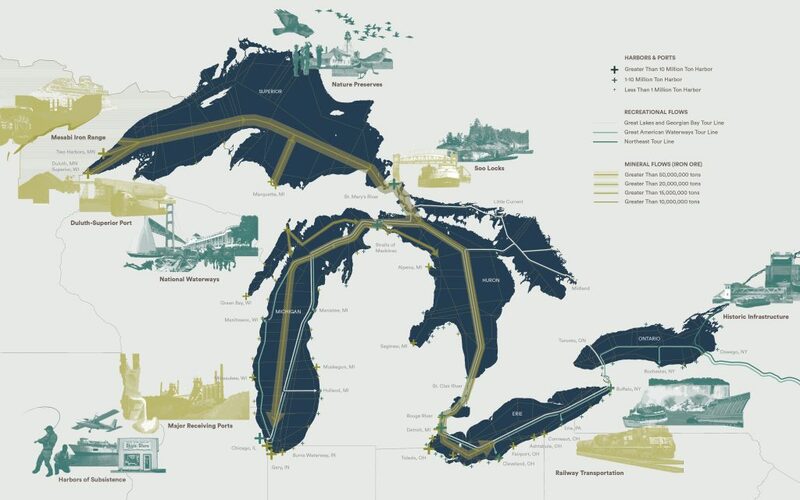 In the Great Lakes region, dredging is interwoven with local, regional, and global economies. Deep-draft dredging (shown in green) makes possible the movement of bulk commodities between inland sites, urban centers, and the Atlantic Ocean. Overlaid onto this larger, deeper, industrial network is a shallower, more localized dredging regime (shown in blue) that enables recreational uses ranging from day boating to shipwreck scuba dives. These two economies work in concert to animate socio-economic life along the lakeshore. Each year, 4 to 5 million cubic yards of bottom sediments are dredged from more than 100 commercial ports and harbors around the Great Lakes—enough to cover Central Park with sediment three feet thick. Finding somewhere to put it presents a serious logistical challenge, particularly when more than half the material annually dredged in the Great Lakes is contaminated enough to require placement in CDFs. Many of these facilities were constructed in the 1960s and 1970s with the assumption that sediment would be clean enough in 20 years to return to open water. This was not the case, however, and cost has restricted the construction of new facilities, driving experimentation with alternate disposal methods. Individual ports and private industry are developing strategies to sort, characterize, and commodify dredged sediment for use as soil amendments, concrete aggregate material, and fill. Smaller amounts are beneficially reused for beach nourishment, upland construction, or habitat creation. Each of the Great Lakes poses its own challenges. Despite its sparse population, Lake Superior hosts the largest port by tonnage in the region: Duluth-Superior. This map (and those that follow for the other lakes) shows federal navigation channels maintained by the U.S. Army Corps of Engineers, dredged material volumes, ports, and the river mouths, where dredging is concentrated. Lake Michigan is the only Great Lake entirely within the United States. Navigation channels perforate its shoreline. The northern portion is colder, forested, and sparsely populated, while the southern part is temperate and urbanized. The lake’s southern watersheds are more intensely farmed, leading to runoff rich in nutrients. While the other lakes all have a general west-east or north-south flow, with entry and exit point at opposite ends, Lake Michigan does not. Its connections to Lake Superior and Lake Huron are in the northern end (righthand side of image), producing a unique “cul-de-sac” circular pattern of water flow around the lake. This feeds a vast system of coastal sand dunes that provide some of the most unique habitat in the basin but also clog many coastal ports with sand. Dredging in Lake Huron is relatively light compared to the rest of the basin. Lake Huron and Lake Michigan are a single lake hydrologically because their connection at Mackinac is through a strait rather than a true river. Near this connection at the northern end of the lake, a uniquely configured dredge channel services the “subsistence harbor” of the Les Cheneaux archipelago, the sole link to the mainland for this island home community. At the southern end, dredging of the St. Clair River maintains an important shipping connection for Detroit. Less dredged and industrialized than its neighbors, Lake Ontario nonetheless provides a critical navigational link between the region and the Atlantic Ocean via the St. Lawrence River. Montreal, Quebec City, Toronto, and the industrial center of Hamilton are located along this stretch of water. Lake Ontario’s water levels are a source of conflict between shipping interests advocating for steady, high lake levels; local residents, who see higher water levels as contributing to erosion and land loss; and environmentalists, who argue for seasonably variable levels to mimic the natural processes that created the lush wetlands and deep pools the lake is known for. 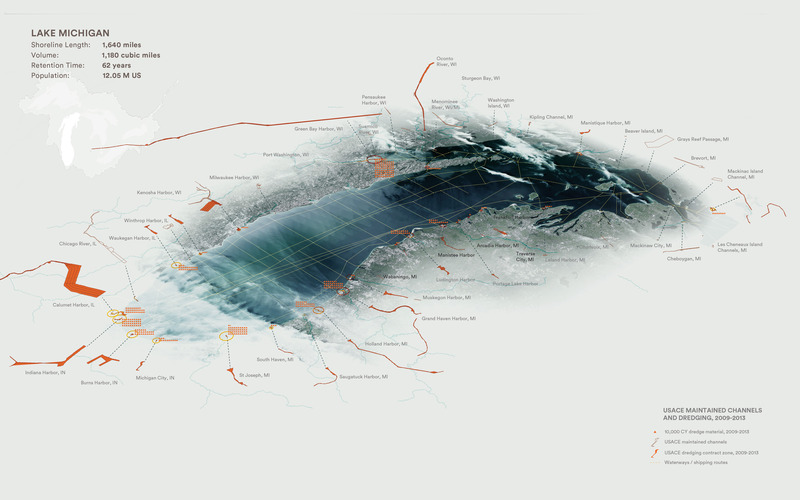 Lake Erie is the most dredged of the Great Lakes due to a combination of urbanization, industry, and shallowness. Dredging activity is concentrated around large commercial ports such as Detroit, Cleveland, and Toledo. One of the most biologically productive lakes, it is heavily industrialized, with ports that directly serve Rust Belt manufacturing. A majority of the watershed is urban or agricultural, and the lake suffers from polluted runoff and algal blooms that accompany high nutrient loads. As a result, Lake Erie exemplifies the tension between sediment management and ecological health. The most obvious evidence of this struggle are the many at-capacity CDFs that checker Erie’s industrial shores. Sediment management in the Great Lakes is changing. Of the 45 CDFs built since 1970, only 20 are totally active, and the system is 80-percent full. While actions such as harvesting sediments held within CDFs for other uses and raising the height of the dikes surrounding the outer edges of the CDFs are marginally increasing their lifespans, capital for creating new facilities is not typically available, indicating an end to the era of confined disposal. This raises the question of future placement options, but it also leaves open the question of what to do with closed CDFs. As CDFs mature, novel ecosystems have begun to emerge that serve as unintended habitats for native and non-native flora and fauna, and create recreational opportunities such as waterfowl hunting. Built in 1976, Site 3 (pictured above) expanded in 1994 to 397 acres and still serves as an active CDF for the Port of Toledo. It replaced Island 18, known as Grassy Island, which was built in 1960 and closed in 1978. Since its closure, Island 18, situated in the muddy mouth of the Maumee River, has served as a 150-acre wildlife area, attractive to coyotes, foxes, and deer. Sediment contamination limits placement and reuse options for dredged material. Contamination is most often introduced to the Great Lakes along tributaries that feed directly into the lakes and from upstream watersheds, where industry and agriculture contaminate sediment moving to river mouths. Take, for example, the Great Lakes’ largest port, Duluth. Located at the mouth of the St. Louis River, the Duluth port is the site of a toxic industrial legacy but also one of the largest and most successful Great Lakes cleanup efforts to date. The contamination of river mouth sediments is related directly to the industrial activities that sustain the port economically. Duluth is engaged primarily in exporting wood and iron ore. Tailings from the mines that produce iron ore contribute suspended and dissolved sediment loads. Clear-cutting upstream reduces forest humus, accelerating runoff and erosion. Agricultural production increases peak sediment and nutrient loads in tributaries, loads which make their way to the river mouth. Today, however, a comprehensive environmental cleanup effort is utilizing dredged sediment to reconstruct wetlands and publicly accessible recreation areas, cap contaminated areas, and restore river mouth habitat. This effort indicates how sediment management is progressing from excess as a problem toward excess as a remedy. 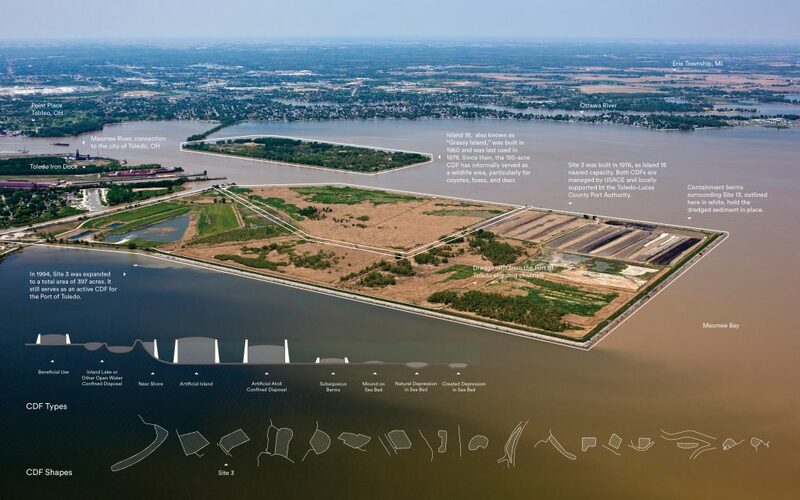 The Cat Island Chain Dredged Materials Disposal Facility, located near the mouth of the Fox River in Green Bay, Wisconsin, demonstrates the shifting environmental sensibility of sediment management in the region. 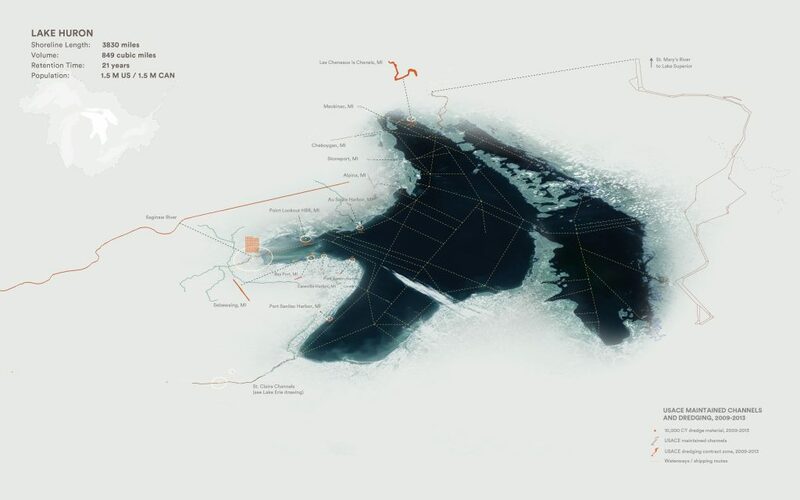 A 4.2-mile-long constructed squiggle serves as a wave barrier and armature for the re-creation of a series of historic islands, which eroded away during the 1970s. The islands disappeared because of hardened shorelines, poor water quality, deepened channels, and elevated water levels that impeded the depositional processes and vegetation to maintain the islands. The barrier protects what will ultimately be 1,225 acres of shallow water and wetland habitat created through the disposal of clean, dredged sediment. Likewise, it will protect wetlands near the mouth of Duck Creek at the southern tip of Green Bay. 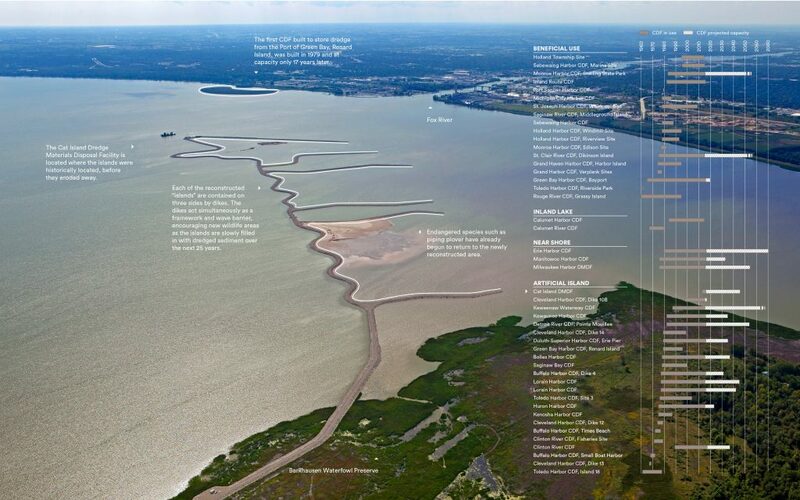 For generations, dredged material was dumped directly in the open waters of the bay. Responding to concerns about environmental contamination, the first CDF for the Port of Green Bay was built in 1979 and filled by 1996. The Cat Islands facility provides a method of placement with multiple benefits. Each of its constructed islands is defined on three sides by dikes, which help contain material and protect it from waves. New habitat will accrete slowly along with the sediment during the next 25 years as the cells are filled in. Evidence of this ecological value is emerging as endangered species like the piping plover return. 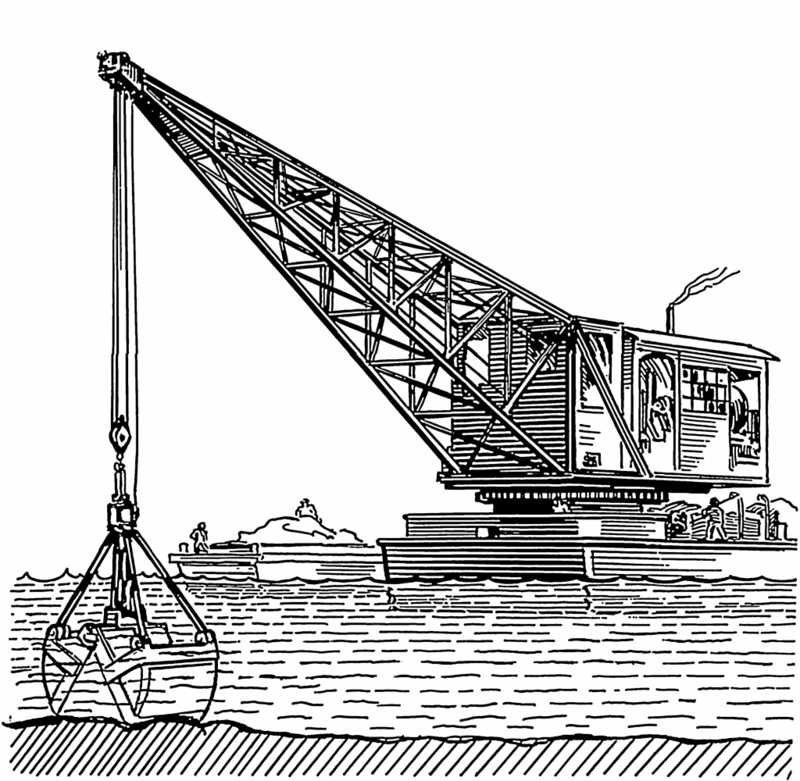 Refashioning life with sediments of the past, the history of dredge disposal in Green Bay signals a broader trajectory emerging across the Great Lakes. 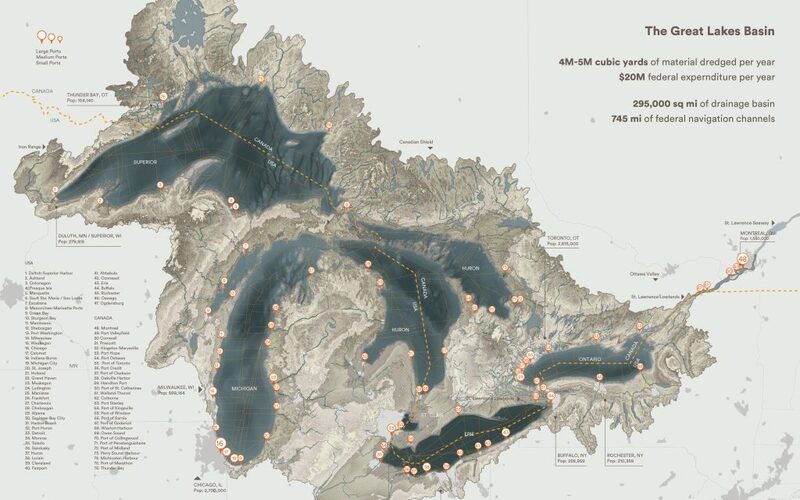 The article is the cumulative work of the Dredge Research Collaborative. 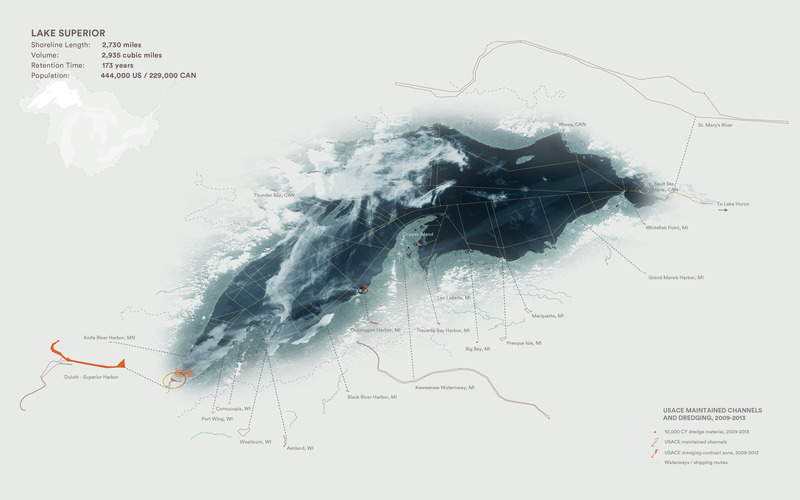 The graphics were created in part by the efforts of the Dredge Research Intern-Collaborators: Michelle Benoit, Alex Hill, Gena Morgis, Nathalie Mitchell, Inwa Park, and A. Gavin Zeitz. This project was made possible in part through support from the Independent Projects category of the Architecture + Design Program at the New York State Council on the Arts with the support of Governor Andrew M. Cuomo and the New York State Legislature. Van Alen Institute served as the fiscal sponsor.